Enjoy the secluded serenity of City living and experience the solitude of quiet moments. Say “hello” to your neighbors, take your dog for a walk on a quiet morning, step outside and view your beautiful landscaping and just let the breeze of spring relax your mind. Well, that’s exactly what you may find in this community nestled off Highway 59 North, west of Rankin Road in Humble, Texas. 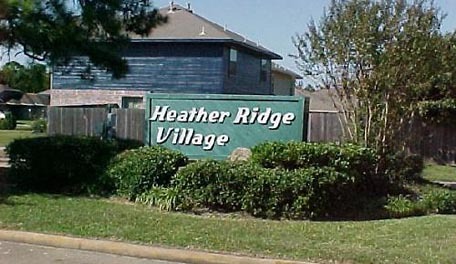 The tranquility of Heather Ridge Village consists of approximately 271 homes with amenities. The community prides itself on their most recent improvement. This year, the community has reconstructed with a new monument and marquee located at the main entrance of the subdivision. The landscaping and lighting will follow soon. The community is always striving to improve. Currently, the Board is doing research for the future addition of playground equipment to meet the needs of the teenagers/adults in the community and upgrading some of the play equipment for the younger children as well. Heather Ridge is also very fortunate to have active committee volunteers who assist the Board and plan wonderful events for the community to enjoy. A community Fall Fest is held each year. The event is designed to promote, enhance and strengthen community socialization and “entertain plain old fashion fun” for kids, adults and guests. In addition to these events, a $500.00 scholarship and a turkey give-away is also held each year. The Board of Directors and its committee volunteers bring a sense of pride to the neighborhood by donating their efforts and time. Great job to all! C.I.A. Services, Inc. is proud to manage such a wonderful community.